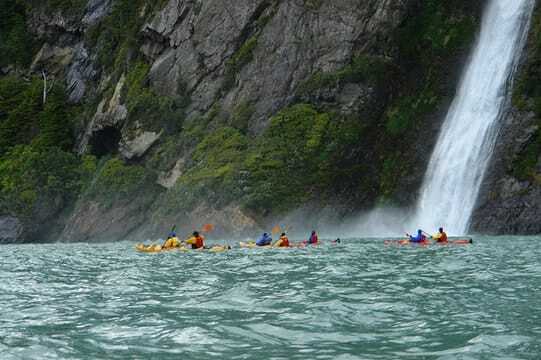 Perhaps, like no other place in Chile, this region retains the exhilharating characteristics of a world of its own, overflowing with magic and enchantment. It's history is intertwined with the rhythyms of the rain amidst wonderful landscape. The sons of Chono (fishermen-sailors) and Huilliche Indians of agricultural tradition, the inhabitants of Chiloé Island carry the sea and the land in their blood. An amphibious inheritance that, mingled with the Spanish one, brought forth a culture aware of its reality as an archipelago, built with the noble woods of its forests, and surrounded by rolling fields studded with apple trees. Practically all of its history and culture unrolls at the shores of the inland body of water, the Gulf of Ancud. It is a coast full of coves and a rough, uneven ground, that is friendlier and more hospitable than that of the Pacific. The startling snow-capped peaks that make up this region's eastern side, tower over deep glacial fjords, lush in their exuberant, green coat of ancient, virgin forests. Most villages are located looking out the sea, which not only provides them with food, but also organizes life and links villages to the islands and the archipelago to the continent. For a Chilote, his boat is his itinerant home, his Noah's ark, and since childhood he has learned the language of the winds, the clouds, and the tides which continuously transform his home by the sea. At high tide, the boats practically reach the houses' front, and when the tide is low, you can see the ground full of navajuelas, choritos, machas and cholgas which the women and children collect to make soup, paila marina, empanadas and pulmay. What should the well-dressed sea kayaker wear? This is a complicated question to which there is no clear answer. The basic problem is that the air temperature may be quite warm, while the seawater in the fjord is cold. If you prepare yourself for a sunny day, a spill from your kayak is liable to chill you to the bone before you can be fished out of the water. If you prepare yourself for the water, you may well find yourself melting into a puddle in the bottom of your kayak. And then, of course, what do you do if it rains? A good compromise for all conditions -and one that is relatively economical- is a "Farmer Bill"-type wetsuit without sleeves but with long legs, which will protect you reasonably well from severe chill if you fall into the fjord. If the day is warm, you can splash water on yourself to cool off (the spray skirt will keep it out of the kayak). Use waterproof sun block or a long-sleeved polyester shirt to keep the sun off your arms. If the day is cool, put on an acrylic or polypropylene jacket under your life vest. It may not stay dry, but it will help keep you warm, and the life vest acts as a partial windbreaker. If the weather turns nasty, you may wish to add a layer of rain gear. Another possibility is a full wetsuit. It is more expensive that the other type, does not allow for ventilation under the arms, but will be considerably better in the water (don't forget, though, that the idea is not to be in the water at all, unless you're in a hot spring). Additional layers of clothing can also be put on over this wetsuit. A third choice is a dry suit. This is the most expensive alternative and may be very uncomfortable in the warm sun. The most economical choice of all is simply multiple layers of clothing that you can add or subtract as necessary. While you're in your kayak, this works fine. If you tip over, you'll chill rapidly and will want to get back aboard as quickly as possible. Proper head gear is another important item. The first consideration is the sun. You may want to use a billed cap, with a bandanna fastened around the sides and back to protect your ears and neck. If the cap and bandanna are water resistant, they will keep rain from running down your neck. A wide-brimmed hat is another good choice. Just be sure it has a chin strap, as lunging for a flying hat is almost guaranteed to land you in the drink. Bring along a good pair of sunglasses, which should also have a strap. For footwear, use a pair of water-sports sandals, windsurf booties, or light sneakers. When you beach your kayak on a shallow sandbar, you should expect to get your feet wet. They probably won't get cold while you're paddling, since they'll be protected below the deck. A pair of windsurf gloves is a good investment, both to avoid blisters while paddling and to help keep your hands warm. Special kayaking mitts are also available.